Posted by Andrew Whyman under Electronics, Life, on 4 August 2013 @ 11:27pm. I got back from camping yesterday, and what a week it’s been. We went back to Shell Island this year as we really enjoyed it last year. Unfortunately we didn’t get to go on the beach much last year as the weather was awful compared to this trip. There was still wind and rain but in between we got serious amounts of sun so we were able to get to the beach a fair bit this year! Some days it was so hot that on one of them I managed to get sun burned in just a couple of hours even with SPF30 cream on! The rain we got was a cracking amount too… If I were to guess it looked like a full days worth of rain fell in 20 minutes. It went from totally bone dry to a sodden puddle laden field in just 20 minutes. I have never witnessed rain that heavy before. 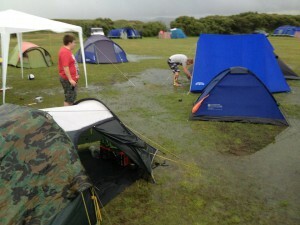 The rain was so bad that 2 of us had to move our tents because a few inches of water had settled underneath! My tent is a few years old now so it’s not as waterproof as it once was. That showed during this rain because it leaked from every possible place it could. Even after moving it the rain was still coming through on light showers so I had to put a spare tarpaulin over the main sleeping area to keep it dry. Thankfully the underside wasn’t leaking as much. 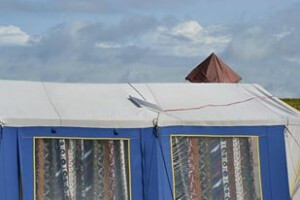 I’m still going to get myself a new tent though as it is about time it was replaced. Getting onto the island was fun this year too. When I arrived (on my own this time but meeting up with others, many of us arrived at different times this year), I was stopped in my tracks at the last 500 yards by the tide. For those who don’t know, the island is not an island as such but it is tidal. Some days the tide covers the road by about 1-2ft making it dangerous to cross by car. I knew it was going to be covered but wasn’t sure how much. Anyway I waited in line for about 45 minutes before I was able to get across. I didn’t want to go through the salty water, but everyone else was doing it and I would have held up the line if I didn’t move along! Thankfully it wasn’t a lot and the excessive rain we had some days cleaned off most if not all of the salt. As repeated every year, my power supply box was once again a center of attention and use by everybody on the trip. One of the guys met a friend on the site and even showed it to him, and he was also impressed. This year not only were phones were charged and Nintendo DS’s charged, even some portable speakers which give much better sound quality than a phone needed a charge too. This year however was different in one more way. Unlike previous years, this time I took along a small solar panel. The last time I did this was in 2006 when I took my jump start pack, CCFL and 2×1.5w solar panels. The panel I took this year was a small 10w panel I got off ebay for £20. 10w doesn’t sound like much (and in reality it’s not) but it was enough to prevent the battery going too low. Last year the power box was so dead that the LED voltmeter didn’t even register a single light. This year, we returned home with 60-70% showing on the box and that was even with much more use of the power inverter compared to other years. I’d call that a big success. I don’t know how much power was generated or used but clearly it was quite a lot over the course of the week. Next year I will have a new setup for the box which will incorporate a digital meter run off of an Arduino along with current sensors (hopefully) which will be able to tell me how much power I have generated and how much I have used. I do need to do some more testing and experimenting with these however. The blog will be kept up to date on developments with this. Next year I hope to have a 20w panel, a smaller battery (to save weight), the new circuit based on the Arduino, more powerful USB sockets and more of them in general, an integrated and hard-wired inverter with a socket on the front and perhaps more. It’s a big project but it’s keeping my basic electronics hobby happy.